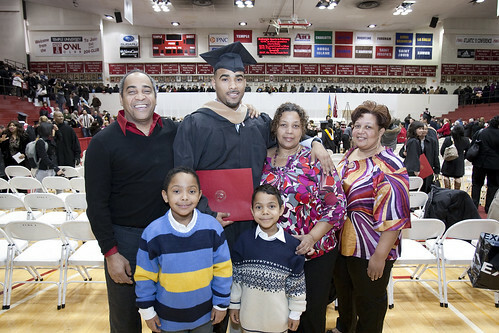 COURTESY JOSEPH V. LABOLITO/TEMPLE UNIVERSITY LUIS GUZMAN’S FAMILY, INCLDING HIS FATHER, CARLOS; MOTHER, VIERKA; AUNT, LEINY MONTEZ; AND YOUNGER BROTHERS, CARLOS JR. AND JAYBIE; POSE WITH GUZMAN AFTER HE RECEIVES HIS DIPLOMA. Luis Guzman doesn’t have to wake up early on May 13 to make it to the university commencement ceremony at the Liacouras Center at 10 a.m. He doesn’t have to iron his gown and make sure to place the tassel on the proper side of his cap. He won’t shake the hand of any dean and receive a diploma. He’s already done all that. Guzman, a senior guard on this year’s men’s basketball team, graduated from the Fox School of Business with a Bachelor of Business Administration degree on Jan. 29 – three-and-a-half years after he started classes at Temple. Guzman said that both of his parents cried throughout the ceremony, especially when Fox Dean M. Moshe Porat specifically mentioned his name. Guzman’s parents are first-generation immigrants from the Dominican Republic. They did not have the opportunity to attend college. Instead, they went right to work to give Guzman as many benefits as he could have from living in the United States. “I did this for them,” Guzman said. Guzman grew up in Bronx, N.Y., and attended Paramus Catholic High School in Paramus, N.J. Paramus Catholic is the largest private school in New Jersey and ranks in the Top 1 percent of Catholic schools nationwide. It offers its students a Catholic, co-educational college-preparatory education in Newark’s archdiocese. Guzman finished his senior year at Paramus as the school’s all-time leading scorer with more than 1,500 career points. He was selected All-Bergen County as a junior and senior, and he averaged 18.5 points, eight assists, nine rebounds and three steals per game his last year there. Rivals.com rated him New Jersey’s No. 9 prospect in the high school Class of 2006. Guzman signed his National Letter of Intent with the expectation that John Chaney would be coaching him at Temple. Chaney retired on March 13, 2006. Coach Fran Dunphy replaced him a little less than a month later on April 10. One of the first things Dunphy did after his hire was call Guzman, who was Chaney’s last remaining recruit. The other two – Matthew Shaw and Mike Scott – opted out of their Letters of Intent. Shaw went to the University of Nevada-Las Vegas, Scott to the University of Virginia. Guzman stayed at Temple. Guzman’s four years at Temple were not without their share of ups-and-downs, though. In his freshman season, Guzman appeared in only 11 games and averaged just 0.7 points, 0.7 rebounds and 0.7 assists in 3.3 minutes per game. Frustrated about his lack of playing time, Guzman turned to then-senior forward Dion Dacons for advice. After one year playing professionally in Uruguay, Dacons returned to Temple men’s basketball last year as the coordinator of student development. Dacons could relate to Guzman. He too played sporadically his freshman season after graduating from Oak Hill Academy in Virginia. Guzman started 27 of the Owls’ 33 games his sophomore season. He averaged 3.9 points per game and 2.3 rebounds per game. Last year, though, Guzman returned to the bench after guard Juan Fernandez joined the team in December 2008. Guzman played in 24 games last season but started only six of them. At the end of the year, Dunphy approached him about the possibility of transferring. “What I said to him was, ‘If you’re going to be the same guy you were the first three years, it’s not going to work, so you might want to look into going to another school. I’m not telling you that you have to transfer, but if you’re going to do the same things that you’ve been doing the last three years … I need you to be a great leader who doesn’t care how many minutes he gets, somebody who doesn’t care about scoring points necessarily but really wants to help any way he can for the team,’” Dunphy said. Guzman used Dunphy’s suggestion as motivation. He vowed that he would do whatever Dunphy asked of him during his senior season. Dunphy, in turn, told Guzman that he would write his name in the starting lineup. This year, Guzman started all 35 of the Owls’ games. He finished the season averaging 4.9 points per game and 4.2 rebounds per game. More importantly, he helped lead No. 12/13 Temple to a 29-6 record, Big 5 title and third straight Atlantic Ten Conference Championship. The Owls made it to the NCAA Tournament for the third time in Guzman’s four-year career, though they lost to Cornell in the first round. Dacons estimated that student-athletes, at least men’s basketball players, dedicate 15 of the 24 hours in a day to academics and athletics. Guzman said that his freshman to sophomore year was his most intense. He took five classes per semester that year (he said he trimmed his class load to an average of four classes per semester after that). Guzman said a typical day his first year began by waking up at 8:40 a.m. every day for class. After that class, he would eat and then trek to his next one. Once that class ended, he lifted weights for about an hour then went to class again. Guzman said he had about an hour or two to relax before eating again, heading to practice, eating his final meal of the day and then spending about two hours in study hall. Guzman said the routine rarely varied during the last three-and-a-half years. Dacons agreed. In order to get ahead in his classes, Guzman enrolled in every summer session. Essentially, he never took a break. Dacons said that Guzman’s academic achievements probably resonate more among non-athletes than among the members of the basketball team, simply because non-athletes might not expect them. Right now, Guzman is finishing up two health classes he needed to take to keep his scholarship. He still interacts with his teammates and has specifically taken a leadership role with sophomore guard Ramone Moore, sophomore forward Scootie Randall and freshman guard Khalif Wyatt. Guzman said that Dacons, Dustin Salisbery and Dionte Christmas took him under their wings, so he figured he should do the same, particularly with young players who may not have the opportunity to play as much as they would like to right now. Outside of Temple, Guzman has started reaching out to agents in hopes of establishing a basketball career somewhere, perhaps even in the Dominican Republic. He recently visited the island and spent time with his family there. The country’s poverty opened his eyes, and Guzman left basketball shorts and shoes behind when he returned to the United States. When he finishes playing basketball, Guzman said he might like to help out in the Dominican Republic and make a difference in the lives of the kids there. For now, he said he just hopes to serve as a positive role model for his two younger brothers, ages 5 and 7. Guzman attended a recent parent-teacher conference with his mother, Vierka, and one of his brother’s teachers asked him who Luis Guzman No. 10 was. His brother had been drawing pictures of him, the Temple ‘T’ and basketballs. All Guzman wants, he said, is for his brothers to succeed more than he has as they grow up. Unable to contain B.J. Raymond and Derrick Brown, Xavier beat the men’s basketball team, 83-74.